If you are a DIYer (do it yourself) when it comes to furniture and have been looking for wrought iron table legs, there are several resources to consider before purchasing the right set for your project. Crafting your own furnishings can be a wonderfully challenging and rewarding process, and it definitely helps to have a few excellent resources in your back pocket. When navigating the furniture world, keep in mind that there are several different options to choose from when looking for wrought iron table legs. Maidens of Iron offers hand-forged table legs that are designed for those who want to craft their own table. Each set of legs comes in industry standard sizes, which are simple to install. One of the nation's top hand-forged architectural metal companies, King Architectural Metals crafts some truly stunning iron balusters and newel posts that can be converted into table legs. Balusters are typically used as a support for a railing, and a newel post supports one end of a handrail at the top or bottom of stairs. With a little finesse and the right hardware either of these products can be easily made into a table leg. Delphi Glass offers several wrought iron table leg bases, which simply need a tabletop to complete the finished piece. These table leg bases are ideal for those who want to craft their own project but don't want to truly build their own table. These bases are perfect for a glass top, mosaic top or any number of hand-crafted tabletops. It is a wonderful way to customize a piece for your home. Hammersmith Studios, owned by Carl and Susan Close, set out to revive blacksmithing in Boston, MA, and today is dedicated to restoring works of metal art and historical ironwork. If you are looking for a truly fine piece of craftsmanship for your table, contact them for a custom set of table legs that are certain to become a centerpiece of your interior design. Mexican Home Art offers wrought iron table leg kits that come in both standard or custom sizes. The kits come ready to assemble, and installing the legs is as simple as screwing the legs into the cross pieces of a tabletop and the mid-leg support into each leg. Each kit can be customized to fit your needs with a variety of patinas or colors. 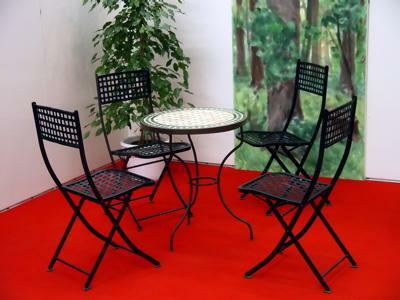 As well, the company works with furniture makers to craft custom wrought iron legs for any shape or size of table. Whether you are looking to craft a custom patio table, a dining room table, a coffee table, or a side table, it is worth the time and effort to find a gorgeous set of wrought iron legs to finish the piece. The most important thing to remember is to do your homework and make certain that you get referrals from anyone who is crafting a custom piece for you.